We go through a lot of pancake mix in our house. As much as I love making pancakes from scratch, the convenience of a good mix can be a time-challenged mom's best friend. There have been plenty of sleep deprived mornings where I've got to get everyone out the door to school and work and wearily reach for my box of Kodiak Cakes whole wheat pancake mix. Don't get me wrong, I love Kodiak Cakes. They are easy to make, made from wholesome ingredients and turn out awesome pancakes every time. But at almost $6 a box, I resolved to come up with my own simple, make-ahead mix that I could keep in the pantry. It took me a bit of trial and error, but I'm finally over the moon -- I mean really over the moon -- with this recipe. It actually might be one of my favorite weelicious recipes because of how versatile it is. I used the mix to make waffles this morning and the kids actually said they were the best I'd ever made! This recipe makes a bit more mix than what you would normally find in a box of the pre-made stuff, but that's a plus, especially if you have a house full of pancake lovers. 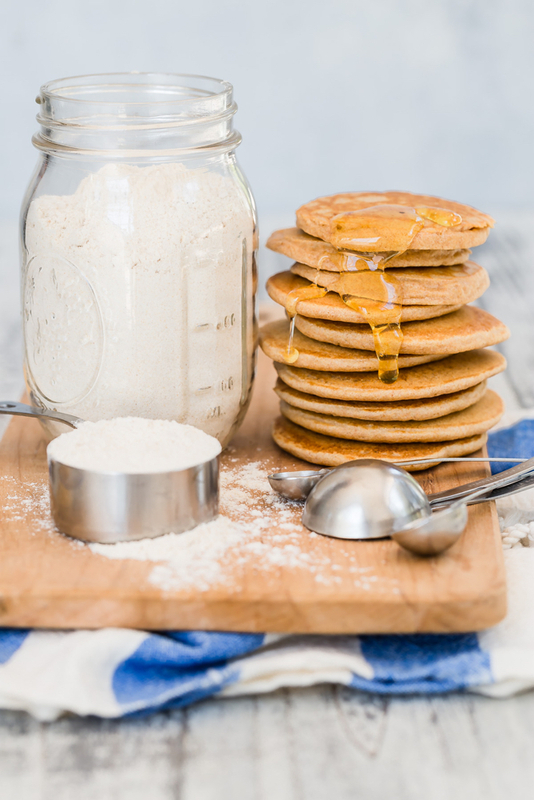 Just keep the mix in an airtight container and anytime you want to make these, just add an egg, milk, a touch of oil and a scoop of mix for whole wheat pancakes or waffles that are sure to please! 1. Mix all ingredients together and store in an airtight container in a cool, dry place. 1. Whisk 1 large egg, 1 cup buttermilk and 1 tablespoon oil in a large bowl. 2. Whisk 1 cup pancake mix until just combined. 3. Heat a large pan or griddle over medium heat and grease with butter or oil. 4. Pour about 1 tablespoon of the pancake mixture onto the griddle, making as many pancakes as will fit and cook for 2 minutes. 5. Flip the pancakes and cook for one minute longer and serve. Note: Mixture can also be used in a waffle iron following manufacturers directions. Awesome! Thanks for this. I always knew it had to be easy, but never thought of making the mix myself in advance. I cant wait to try this!!! My husband has his own mix but I am really looking forward to a whole wheat one. Plus my 2 year old loves pancakes!!!! This looks great! Thanks! Can we freeze the already made pancakes/waffles and pop in the toaster for busy mornings? Yes! Place on a cookie sheet in the freezer for an hour or so, until they are frozen, then transfer to an airtight container and store in the freezer up to 3 months. When ready to eat, transfer to a toaster directly from the freezer and toast to desired doneness! I do this often and it makes a great quick breakfast for busy mornings! Couldn't you leave the sugar out of the dry mix and add honey in with the wet ingredients? How much honey would I need to add per batch? Could you use regular whole wheat instead of the white whole wheat? You can! It will yield a more dense and nutty flavor than the White Whole Wheat. This looks great, could we use this with your pancake sausage on a stick recipe? And if we can, can we freeze those once made? Thanks - excited to try this! I've always bought the Hodgson Mill mix at the store but I bet this would taste even better. Thanks for the recipe! We always make ours with whole wheat pastry flour. Do they yield different results? Yes, White Whole Wheat has a slightly different flavor and texture! Whole Wheat Pastry Flour will yield a similar consistency to White Whole Wheat: lighter and less dense than Whole Wheat. Does it need to be white whole wheat flour? Will just plain old whole wheat flour work? I had been looking for ways to make a homemade pancake mix (kids are not liking the frozen pancakes anymore) and bamm.. today I see this post! THANK YOU so much for sharing this recipe! All your recipes are perfect and always come out well. what is \"white whole wheat flour\" I bake alot and have never heard of this. and like others that asked can you just use plain whole wheat flour?? She must mean Whole Wheat Flour..I don't think I have seen White Whole Wheat Flour. I would rather have plain ole Whole Wheat Flour. White sounds like they did something to it..
White whole wheat still has all the same nutritional benefits of whole wheat flour because it is made in exactly the same way, and so it has more fiber, vitamins and minerals than most all purpose flours to. It can be used in any recipe that calls for whole wheat flour and, because it has a lighter flavor, will generally give you an even tastier result than whole wheat will. Wow, thanks for the detailed comments ShaToina! thanks for the info! it says you could use it in place of whole wheat flour, but could it also be used in place of all purpose flour? My kids have milk and egg allergies. Wondering if anyone has tried this mix with a commercial egg replacer or substitute like apple sauce? I make pancakes regularly with Trader Joe's multigrain mix and Ener-G egg substitute and it works great. I'll have to try Catherine's mix. I'd love to see some variations on the pancake part of the recipe. For instance, can this mix be used to make pumpkin pancakes? Add some spice for gingerbread? That would make it SUPER versatile. Either way, I can't wait to try this. Thanks! Also curious about using it for pumpkin pancakes! I love the idea of using pumpkin or applesauce as an oil substitute in baking but not sure on adjusting other ingredients. I've been doing this for years as pancakes, but didn't know I could do waffles too!! Great idea! I've contemplated making something like this, just do not have the time to test it out, so THANK YOU! My 2-year-old LOVES pancakes, so would be nice to be able to make them in the morning even. Any guess on long would the mix keep in the pantry? In all honesty, this mix should stay good, if stored in an airtight container in a dry place, for as long as the flour, baking powder, and baking soda are good according to your packages. To err on the safe side, though, I would suggest using this mix within three months. My kids keep asking for the pancakes and waffles and we used up this entire mix in about three weeks! I am now using my second batch! Just a note: regardless of package dates, you should replace your baking powder about every four to six months after opening to ensure maximum freshness and performance! My daughter has a milk allergy. Would I be able to substitute with Rice Milk or Soy milk? Yes! You can use any type of milk you prefer. You can even squeeze some lemon juice into the Rice or Soy Milk to make \"buttermilk\"! I am so thrilled to find this! My kids love whole grain pancakes/waffles and I am so sick of buying them. I have been wanting to find an easy go to homed recipe and am thrilled with the make ahead mix idea! We LOVE the white whole wheat flour from TJs and use it in many many things! so excited! this could be used for the banana bites too right? also i buy unbleached white whole wheat flour from fresh and easy is that the same the recipe calls for? Yes! Unbleached White Whole Wheat Flour! This will work for any of the weelicious pancake recipes! 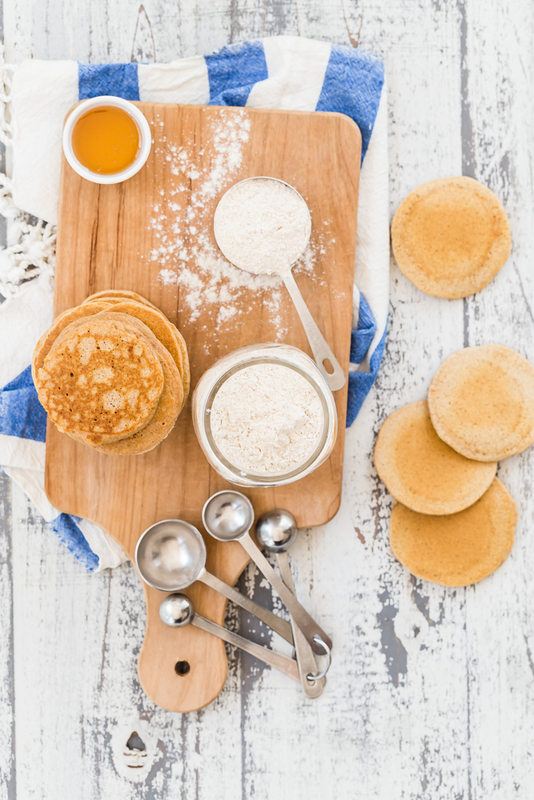 the easiest way to make pancakes is to use 1 cup self-raising flour, 1 cup milk and 1 egg and a pinch of salt. Sounds great! Will try this soon. If I wanted to incorporate some oat flour, how much do you think I could do? If I replaced half of the wheat flour with oat flour do you think that might work? Thanks for a great recipe! Oat flour makes baked goods chewier and more crumbly so I would start with subbing half and see how they come out! You may need to increase the milk or oil in the recipe. I'm so excited to try this! I had been looking for homemade pancake/waffle/biscuit mixes as I won't feed my toddler frozen waffles. I found a recipe for biscuit mix but it has shortening in it. Have you tried this mix for biscuits or anything else? Will get some flour this weekend and have pancakes! Thanks! I make my own and add wheat germ and buttermilk powder, then simply need to add the egg, oil &amp; water to the mix. My kids love it! My dad used to pre-make pancake mix in baggies for camping trips. Just add eggs, oil, and milk and he'd fry them up on the iron skillet over a campfire! I use White Whole Wheat which is a different (lighter) texture than Whole Wheat and I have found that it produces a much fluffier and not crumbly pancake. You can find it at Trader Joe's and usually at your local grocery. Bob's Red Mill is a great flour brand to look for! Catherine, thank you so much! Since today is my birthday, this is an awesome present from you and I'm going right now to make my mix!!! Awesome - thank you! I have been looking for a recipe like this. Just made these for dinner tonight and all three kids devoured them! And that's saying a lot because my 9-year old is super picky. In the spirit of culinary \"flexibility\" I think you can pretty much use a mixture of whatever flour you have handy, or prefer. In my case, I used 1/2 white flour and 1/2 whole wheat. The possibilities are endless. I also added 1 tsp. of vanilla extract to the wet ingredients. I love your recipes and am a big fan of your site. Thanks again! probably a dumb question, but how much mix would I scoop out for a batch? it would seem to be that I would need a bit over a cup for each batch since it makes six batches, and there are six cups of flour and about a 1/2 cup of other stuff? 1 Cup of Pancake Mix for each batch! If I were to sub this for another pancake recipe, such as the Gingerbread ones, is the flour to mix ratio 1:1? Of course I wouldn't add baking powder or soda since it's already in the mix. Thanks! Oh, and we LOVE your recipes!! Yes! Use this in place of the flour, baking powder, baking soda, salt, etc in any pancake recipe! These were AMAZING! I made this recipe this morning and my 20 month old daughter - who is also a very picky eater - ate 4 pancakes!! I did the two recipes off the BBC Food site. Firstly Delia's cssialc pancake batter, and then an American pancake batter. I didn't separate the eggs, but it uses self-raising flour, and more proportionately than the crepe mixture.Both absolutely great.I couldn't find maple syrup in my co-op, but Sainsbury's came up trumps. These are great!! I added 1/4 c of pumpkin, 1/2 tsp cinnamon &amp; 1/8 tsp nutmeg and they are the best waffles I have ever had. Thanks for the easy mix recipe! Could you add ground flaxseed to the dry mix? I know it would change the consistency, but my daughter loves pancakes so I'm always up for adding extra nutrition when and where I can since she seems to be going through a strong-willed phase. You could add ground flaxseed to the dry mix. I would start by substituting 1/4 Cup of the flour with 1/4 Cup of ground flax seed and see how they come out. I know 1/4 Cup compared to 6 cups doesn't sound like much, but you'll have to test it and see how you like the consistency and flavor! Just made these today - thank you so much! Tastes fantastic and SO easy. My kids loved them and so did the adults. My daughter is allergic to dairy. Can I just use almond milk, or do I have to add lemon to the almond milk? You can really use any type of milk you prefer, including almond, rice and soy. I love the flavor of buttermilk which is why I suggest adding the lemon juice, but if you don't prefer that flavor you can leave it out! That is what I LOVE about this mix. It is so versatile! I meant to buy the white whole wheat flour, but ended up with just whole wheat from the king arthur brand. . .could I mix half reg. flour with the whole wheat to make it taste more like the white whole wheat? Or will it still have the really nutty chewy flavor?? Thank you! You could definitely do half and half! It won't be exactly the same as using white whole wheat, but it'll still work! I haven't made these yet, but they are going to be xmas presents this year from my 14 month old son, who is an avid pancake fan! Can't wait to try these and share your mix with others! Can't wait to make these but quick question. How much of the pre-made pancake mix do you use to make the 4 servings? I see what you mix it with but I'm not sure how much to use. I haven't made these yet but like to add a little flax to my mix. How much would you recommend I add for a little added health benefit but not loose the yumminess. I have noticed that you often say what kind of products you like to use. I need a griddle, What do you recommend?? Thanks!! I have a double burner cast iron griddle that I love. I can cook 5-6 pancakes on it at a time! I made the mix because I love quick breakfasts in the morning esp. with 2 kids. I didn't have white whole wheat flour so just subbed in all-purpose flour. I made pancakes the other day, and although the taste was great, the pancakes were very flat. Today, I attempted to make waffles. I noticed the mix was a bit watery but I poured it onto the hot buttered waffle iron anyway. It all spilled out, got stuck to the sides, and needless to say made a huge mess. What did I do wrong? By the way, your other whole wheat waffle recipe (even though I used all-purpose flour) was a huge hit! Finding a white whole wheat flour is almost impossible in my country. The closest thing I found is bob red mill whole wheat pastry flour.can i use it as sub?or is it the same with white whole wheat flour? I'm looking for a wheat pancake that can take on a variety of veggies and taste yummy. I've tried other recipes, but they haven't won over LO. My adventurous eater has entered the \"no\" phase at 18 months. Can I omit the sugar and add grated veggies and fresh herbs? Perhaps cheese? And could I freeze them to reheat later? Sorry. It's just the sweet pancakes are a sure winner, but I need to send him to preschool with yummy nutritious foods, like veggies. I love that you don't hide veggies! Any input would be greatly appreciated. If I only have regular whole wheat flour, would the measurement be the same? Yes, same measurement! The pancakes will come out more dense and chewier! Great News! Congrats Dr. Davis! I will be watching. Wear your Teflon cniohtlg please! On another note: my inbox today had an article from Medscape for nurses edition on another new drug Omega-3 PUFA for Hypertriglyceridemia. WHAT?? I did a serious double take, got my glasses, and read it again.. Why does that just seem wrong, Omega-3 and PUFA in the same sentence, never mind the same capsule! Reading on I see it's a component of the overpriced and much touted Lovaza. Just WHY? ?For heavens sake, just eat some salmon already, eh?I try to stay away from PUFA's as much as possible. Big Pharma will just never get it will they? We want to hear all about your experience on the show! Ok? How long is this mix good for if stored in an airtight container? because it is all dry ingredients you can keep it for several months! I have already made these once before and my kids love them!! Would like to make them this morning but realized I don't have vegetable or canola oil. Can I sub coconut or olive oil instead?? Coconut oil works great for pancakes and waffles! You can also use melted butter! LOVE this BUT can you completely omit the sugar and still have it work out? You can omit the sugar, but they will be a totally different flavor! I'm a newbie. In your ingredients' list you have \"whole wheat pancakes or waffles\". Do I need to buy these ready-made pancakes to make the mix? Don't understand! Help!! The ingredients list first lists the ingredients needed to make the mix. Then it says \"Whole Wheat Pancakes or Waffles\" and gives the remaining ingredients needs to actually make pancakes! :) Hope this clears it up for you! My daughter had to go without milk for a short period. I actually substituted the milk and eggs with some applesauce and a little water. Then I add vanilla and agave nectar. Delicious! I'm wondering if this mix can be used for biscuits too? Any idea what would need to be added? My only question with this recipe, is how can I incorporate dried egg whites into the mix? And is the oil totally necessary? I use Kodiak Cakes all the time and like that they don't use any oil. Just water. (I calorie count big time.) The oil adds calories, but Kodiak Cakes does not use it. We made the pancakes this morning without oil and they came out fluffy and delish. Thanks!!!!! Question: will I be able to substitute the flour with coconut flour? I haven't tried coconut flour, but a good all-purpose gluten-free flour should work just fine! Ive made these as pancakes before and they came out great, but I just bought a new waffle maker and wanted to try this recipe as all your recipes have pretty much been winners with my family. Not sure what I did wrong, but the batter came out a little runny for waffles and when the waffles were done they weren't fluffy :( The only difference I did was use coconut oil and made the buttermilk with lactose free milk and lemon. 1 cup of liquid makes the batter too runny for waffles. I made it for the first time yesterday for pancakes and noted that if I were to make waffles one day, I would start out with less milk and add until it looked to be the right thickness for the waffle iron. If I wanted to use butter instead of oil, would it turn out ok? Would it be 1 tablespoon of butter, melted? Thanks! I think what you're doing is okay. It's sometimes tough to get kids to eat ANYTHING, so getintg some juice or some (fortified!) cereal in them is an achievement.I did try to do fun things with my tween when she was younger to get her to eat new foods. Let her pick it out at the grocery. Let her help with preparing it. Using a fun cutter (I have a cute rippled one from Pampered Chef) to cut up cucumbers and carrots. She never liked ranch dip, but I know a lot of kids do, and that might be a way to get them to eat veggies.And cheese (usually string, but sometimes cubes of colby jack or the good deli stuff, sliced thinly YUM!) and yogurt were always the snacks I let her choose from. And if she hadn't eaten all of what I thought she should have eaten from her meal prior, that would be her snack for the day. No exceptions.I also now do make her take a few bites of whatever veggies she really doesn't care for. She would gag, she would scream, she would whine and cry. And I would just look at her and say go ahead. But I'll still be here to make you eat it when you finish being so dramatic. And it worked. She stopped doing all of that and just asks now, how much do I have to eat? Usually, it's the full (but very small in portion) serving of what I gave her. I won't give her more than a few bites, but I do expect her to not throw it away.Sorry that was way long!I have never sneaked food in, but I do count spaghetti sauce as a veggie!I'm so glad I found your blog from an Alexa blog hop!! I think you're doing a great job and am happy to also be following you on Twitter and Facebook! I don't normally leave comments but I have been using this recipie for about 3 years and I LOVE it. So much better and healthier than the boxed pancake mix and just as easy. I have 4 year old twins who gobble them up. I haven't made with buttermilk but do the vinegar trick and they are delish. I have also used just milk instead of buttermilk and they are good that way too. Thanks!! So great to hear, thank you! I love this mix! It makes delicious and fluffy pancakes every time! Today I tried making it with some whey I had leftover from making homemade yogurt in place of the buttermilk, and it worked wonderfully! Thank you for sharing your recipes...this is one of my favorite sites for kid-friendly food! LOVE this recipe! My kids LOVE pancakes but I hate all the preservatives in the box stuff. I also hate making the whole kit and kabooble every morning they want pancakes. This was great! I didn't have buttermilk so I used 2/3 cup plain yogurt and 1/3. cup whole milk. Worked wonderful! Also felt it was a little healthier with the yogurt. The mix is thicker than I'm used to for pancakes but it works and I have to get used to the fact it supposed to be thick. They are fluffy and wonderful! This recipe is definitely a gem. I’ve been making these pancakes for years and my boys love them. I recently bought Kodiak dark chocolate waffle mix and was wondering how I could change up your recipe to make “healthy” chocolate waffles? Any suggestions would be greatly appreciated!